This entry was posted on Thursday, February 8th, 2007 at 2:54 pm and is filed under Brakes, Do It Yourself, Technical Info. You can follow any responses to this entry through the RSS 2.0 feed. You can leave a response, or trackback from your own site. I usually try to write about technical stuff and to write about fun stuff to spice the blog a bit because it sometimes seems very cool that I simply can’t resist. In the future, I promise I will try to put more technical articles that are related to engines and trouble shooting. really glad to hear from you. Thanks again! This is a great article. I just purchased my forst E34, 318i 4door, 5-Speed. The parking/emergency brake doesn’t do much and this article helped me adjust it. so there is no adjustment at the wheels? 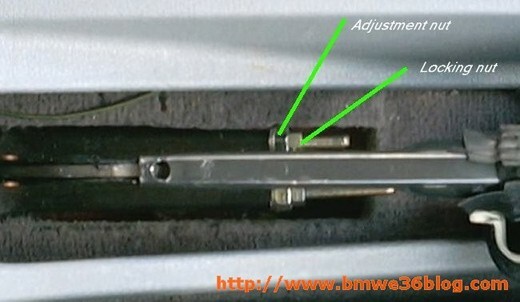 The way I adjust my handbrake cables to obtain even braking is once I think that I’ve got the bolts & jamb-nuts tightened, I accelerate the car to 10~15 MPH, put the clutch in and yank hard on the handbrake handle, locking the rear wheels. Check the skid marks or feel if the car is tracking in a straight line, if it is and the handbrake handle clicks between 5~8 clicks to full engagement, you’re OK. If not, or the car pulls one way or the other, adjust that side cable & retry again. Works for me. If you have an automatic transmission, just pop it in neutral to do the handbrake pull. 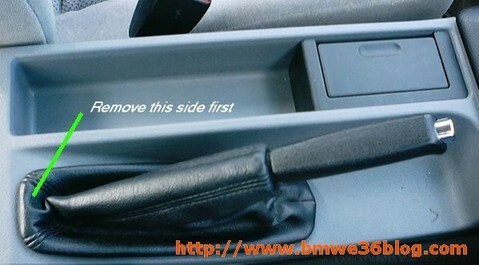 You are here : Home » BMW E36 Handbrakes adjustment!